I just finished an image with a bit of an interesting story. Our daughter, Logan, is in her senior year at the University of Nebraska/Lincoln majoring in Meteorology. She is a member of Kappa Delta sorority, which holds an auction every year to raise money for the sorority house. 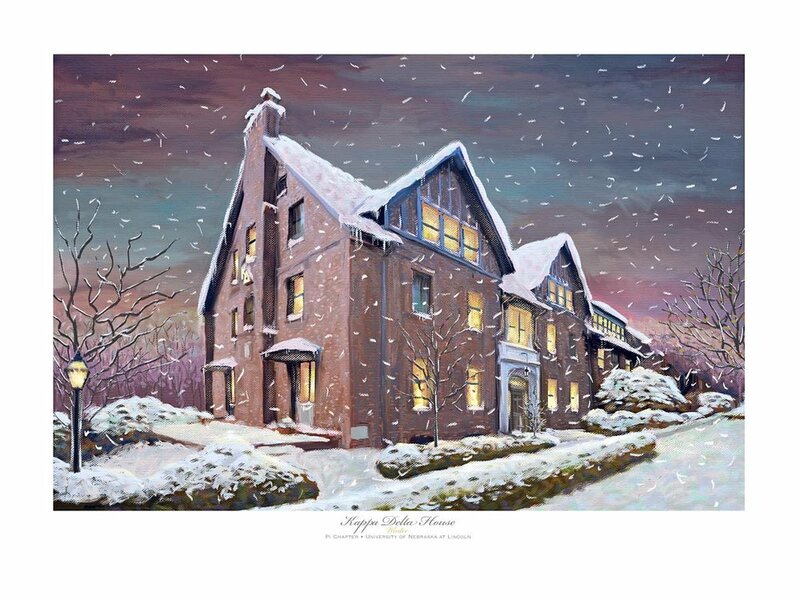 Last year, we donated a print that I did of the sorority house on UNL's campus. I shot the reference imagery in the late summer and then interpreted the photograph into an autumn scene using Corel Painter. The print was purchased by one of the sorority girl's parents and donated to the house where it now hangs in the dining room. I was subsequently asked if I would create a second version...this time in a different season. For the winter version I used my Photoshop Artists' Brushes. I find it interesting to compare the two paintings with the use of each application used to create each in mind. What strikes me—and I think that this should be a goal of the artist—is to not let expressive software impose its signature on the resulting artwork. Looking at these images, I don't think that either the Painter or Photoshop pedigree is apparent in either painting. Rather, my style —if there is one— is what comes through the pieces.